Last month, I blogged in general about yoga, a five thousand year old approach to life that originated in India and has steadily gained adherents since. The broader view now narrows to yoga practices specifically targeted to office workers as well as those who simply spend a lot of time in front of a computer, including my fellow writers. First word of advice: get up once in a while, preferably at least hourly. Bust out a few poses to heighten your physical and mental health. Inversions will push more blood to the brain and improve its functioning. Of course you could do a headstand or a shoulder stand, but that might draw unwanted attention to your corner of CubicleVille. So I suggest you try a simple wide-legged straddle stretch, known in YogaLand as Prasarita Padottanasana (we yogis love to bring out the Sanskrit--makes us feel as though we're in possession of some arcane knowledge). This pic is okay, but don't put your hands on your knees! Floor, shins or thighs for support. The point is: get your head below the level of your heart, which promotes blood flow to the brain. To perform the posture, always remember that every yoga pose is built from the ground up. Make sure that your shoes will keep you steady--don't wear high heels or slippery-soled shoes. Take them off if you are, and make sure that your stockings or socks or whatever won't slip. Ideally, you're barefooted. Feet should be planted firmly on the ground about three feet apart, or more. Whatever is comfortable for your body that day. Breathe deeply and evenly. First spread your arms out into a T, then, on an exhale, bend from the hips, not the waist, keeping your spine straight. 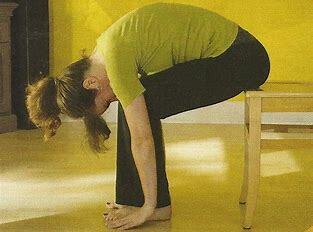 If you need support, you can place your hands on the floor, on your thighs or shins. Not the knee--joints are sensitive. Keep breathing long, deep, complete breaths. Take at least ten full, complete breath cycles. If you want to twist (highly recommended!) place one hand on the floor in front of your face, then raise the other into the air. Exhale, and twist in its direction for five complete breath cycles. Focus on how these breaths feel compared to the untwisted variation. Then do the other side. 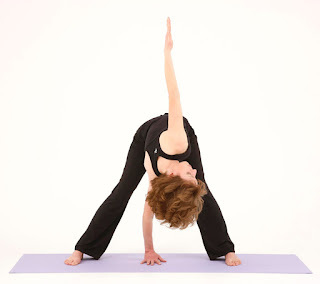 To come out of the posture, untwist, put your hands on your hips, bend your knees slightly, tighten your core. Inhale, and pull your torso upright. Broaden the chest, open the heart, free the breath. I probably say this at least ten times in every class I teach. The breath is so, so important! Not just in yoga, but in life. We can survive a week or two without food. A few days at least without water. But without breath? Not very long at all. Breathing deeply will help you in every area of your life. Take a deep, slow breath with a slow release before and after any task. Shove oxygenated blood though your body and feel the energy, the prana, flow and strengthen you. We spend so much time hunched over at our desks, curving our chests, constricting the breath and squeezing our hearts, when we are so much happier with our hearts open--literally as well as figuratively. So, employing the same posture, try clasping your hands behind your low back and lifting them, which will open your chest. Breathe deeply--again, at least five to ten complete breath cycles. If you are so unfortunate as to have such a small cube that you can't even do prasarita, much of the above can be done in a chair. 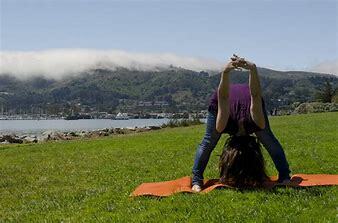 Dharana is one of the eight petals, or limbs of yoga. (As I discussed in the previous blog, these are techniques which we employ on our yoga journey--that's the path we tread to attain integration and happiness). Certainly mental focus will help us on our journey, as well as in our everyday lives. So how can we easily practice dharana? The inversion and its variations will help sharpen the mind, but there are other techniques, including something so simple that few think of it. Research has shown many times that learning a new language improves mental functioning, but that's not because there's any intrinsic virtue in learning Mandarin, Swahili, or French. Any new undertaking grows our neural net, creating new nerve paths and synapses in our brains. There are hundreds of yoga poses, and a smart yogi will vary her practice, learning new asanas (postures) and breathing exercises (pranayama). However, many other options exist. Something as simple as skipping instead of walking, taking a different route to work, traveling to another country, or learning a new computer game will increase your brain power. Quit multitasking. Instead focus on one thing--the moment. This is a tough one. Our modern, complex society demands much of us, and those demands create what many of us all the "monkey mind," the headspace that is scattered, unfocused, and constantly shifting instead of concentrating. Be in the moment, focusing on what's happening instead of what could be happening. If you're working, focus on work, not on where you're going to eat lunch or any task that might be facing you. When you're with a friend, a family member or anyone else, be fully present for that person. Don't check your phone... Whatever else night be going, in most instances, it will keep. (Besides, checking your phone when you're with someone is really rude). Be present and focused on the moment. As the old Latin proverb says: Age Quod Agis--do what you're doing. As always: ask your doctor if it's okay for you to perform easy exercises.